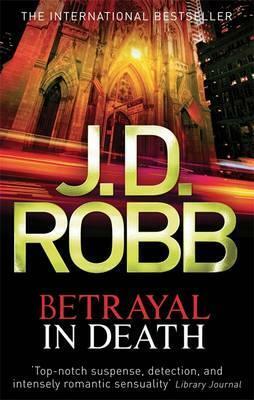 Betrayal in Death is #12 in the In Death series - I am reading my way through them gradually! I set out determined to work out who the murderer was before it was revealed. However it was apparent who the murderer was right from the start. As it says above, it's Sly Yost. He's wanted for a number of murders. What isn't apparent is who he is working for - someone with millions though because his fee is in accordance with his lifestyle. Sly is murdering people that have something to do with Roarke. He has managed two and has his sights on number three. Eve knows it will be someone closer to Roarke next time, I guessed who it was - probably as intended - and I was saying to her put a watch on him for goodness sake. As it turned out - she had much to the 'shall rename nameless person'. I was suspicious of one person who could be involved and that paid off. However not quite in the way I expected. J. D. Robb deals with the likes of me quite easily. In these murders Eve and her team have to work with the FBI which doesn't go down well, with either party. So sparks fly, as they do as well between McNab and Peabody. Eve and Roarke grow closer. This had all the hallmarks of another great read in this series, suspense, relationships, humour. Eve of course puts the clues together with her trusty team and acts in the nick of time. I wonder how long will Eve remain a lieutenant or will she move up to captain sometime soon?